Alfred Myers was 33 when he was called up. He was a mines deputy and worked with his two brothers in the ironstone mine. A single man, a member of the Loftus branch of the International Labour Party and a devout Wesleyan Methodist. He was member of his church's choir, a Sunday school superintendent and a trustee of the local church. In March 1916 he was amongst the first to be called up and one of the first to claim exemption on grounds of conscience. He failed to register for military service on the due date and was arrested. At his tribunal he spoke of his belief in an international brotherhood of man, and said that he ‘could not conscientiously kill, nor assist in killing’. He refused non-combatant service and was incarcerated in the cells of Richmond Castle. There he continued to to refuse to co operate. Particularly in the early days of conscription the Army had no idea how to deal with men who quietly and resolutely refuse to acquiesce to orders. Its response in the face of apparently incomprehensible resistance tended to respond ruthless. After various failed attempt to get Alfred and a number of other CO sharing the cells of the castle to put on a uniform someone had the bright idea of threatening to send them to the front where, if they disobeyed orders, they could be shot. Despite this very believable treat under the circumstances, Alfred and the other continue to resist. Desperate to beak the men's resistance orders were issued to send Alfred and the other COs to the front. The details of this cruel and illegal action can be found elsewhere. Despite the immense pressure applied in the camp in Boulogne, now a war zone, Alfred continue to resit and was found guilty by the court martial. He was then sentenced to death. This was later commuted to ten years hard labour. 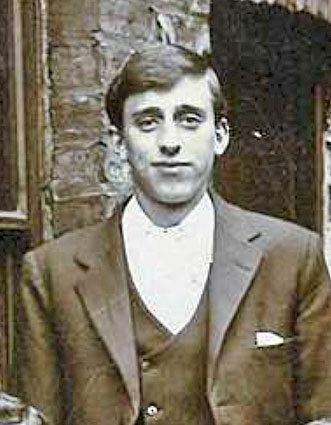 Alfred was returned to Britain and sent to Winchester civil prison to serve out his ten years sentence. By July prisons were filling up with conscientious objectors and causing sever overcrowding. To cope the authorities devised a scheme which they hoped would get the COs out of prison but still under state control. This was the Home Office scheme under which men had to agree to perform 'work of national importance' as long as it had no military connection. On this basis Alfred was sent to Dyce quarry to break rocks, then to Wakefield Work Centre where he objected working for a private employer (whose men had join the army) and chose to go to prison instead and spent tine in Northallerton CP and Maidstone CP and was finally released on 12 April 1919.